Did you know you can find FREE embroidery designs to download and use from the web? Yes, you can! 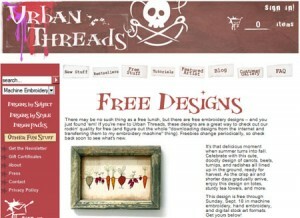 Here are three of my favorite places to visit and find free designs to download. As with any embroidery design, be sure to read and follow the intended use and copyright for each design. The BERNINA USA website offers a whole page of designs sampled from current exclusive BERNINA Design Collections. Hurry, these designs are only available for a limited time before they are replaced! Visit the BERNINA USA Free Embroidery Designs page. Not only are there hundreds and hundreds of embroidery designs to browse at EmbroideryOnline.com, but they also offer some select designs for free. Find the free designs from EmbroideryOnline. Oh, and while you’re browsing at EmbroideryOnline.com, be sure to check out the Projects page for free downloadable project instructions and patterns! UrbanThreads.com is my favorite place to go for funky and off-beat embroidery designs. Best of all, they offer different designs for free! And be sure to check back as UrbanThreads.com changes up the free designs on a regular basis. See what’s free over at UrbanThreads.com. There’s also super cool project tutorials available that are perfect for embroidery – check them out right here! Now that you have some new designs to play with, go get embroidering! 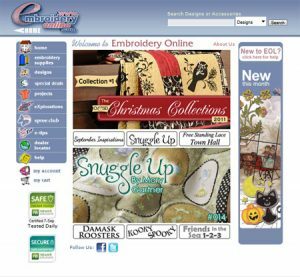 SewForum.com also has many free designs and many of the above mentioned digitizers are members.